If Stranger Things, Netflix’s new horror-nostalgia joint, sucked you in this weekend, chances are you also became entranced with the show’s credits. At first, all that appears are neon red lines, eventually zooming out to form the title in a distinctively Stephen King-esque font. Just as the show has garnered critical acclaim, the titles have also won over their share of fans. Decider even deemed them “the best thing on TV right now.” When The A.V. Club spoke to the show’s creators, Matt and Ross Duffer, we asked them to share their thinking behind the sequence, which was ultimately designed by Imaginary Forces. There was never a question that the Duffers wanted to use a version of the typography so clearly associated with King, even sending Imaginary Forces books—mostly King paperbacks, with some others mixed in—as reference points. As Matt explained, less can sometimes be more. “You see that with big movies nowadays: When it’s so huge and pure spectacle it actually ends up somehow feeling smaller,” he said. 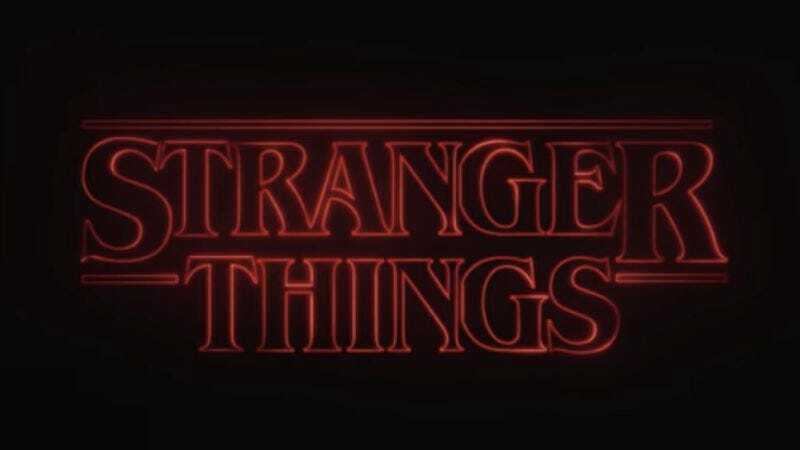 “Sometimes scaling back makes things feel actually more epic and more enormous.” So while you can’t mine the Stranger Things titles for hints that might help you solve the season’s mystery or use them to orient yourself, you can marvel in them. And that’s quite enough.